Source: Tobacco and E.J. Parrish, photo by Donald Burgess Tilley Jr. 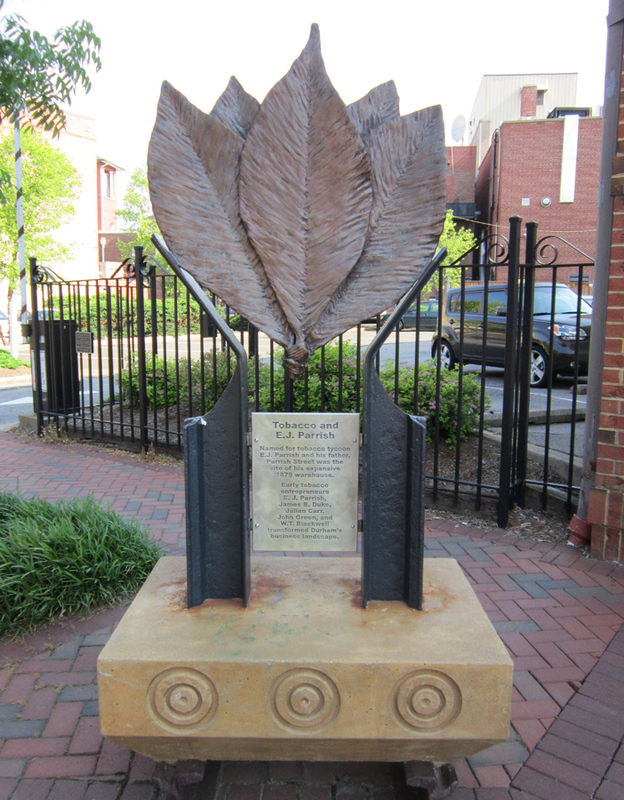 This bronze sculpture is the first in a series of six monuments documenting “Black Wall Street” in Durham. It highlights the importance of the tobacco industry in Durham County; in addition, it honors the life of E.J. Parrish, a tobacco tycoon in the area who built a warehouse on Parrish Street. 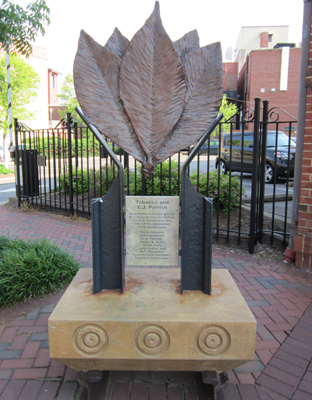 The sculpture features five large-scale tobacco leaves above a plaque. Named for tobacco tycoon E.J. Parrish and his father, Parrish Street was the site of his expansive 1879 warehouse. / Early tobacco entrepreneurs E. J. Parrish, James B. Duke, Julian Carr, John Green, and W.T. Blackwell transformed Durham’s business landscape. Tobacco has been an important part of Durham’s history since the 19th century. Tobacco entrepreneurs such as E.J. Parrish and Washington Duke marked the early business landscape of Durham. The sculpture sits on historic Parrish Street, which is better known as “Black Wall Street.” It is part of a series of six sculptures that each commemorates important pieces of Durham’s history. This sculpture rests in downtown Durham. There are a few trees close to the monument.